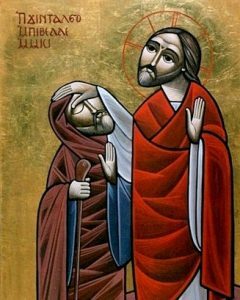 The story of the Man Born Blind is the third Sunday Gospel in Pascha about the mystery of baptism. This gospel is very clear, “Jesus spat on the ground and made clay with the saliva, and smeared the clay on his the blind man’s) eyes, and said to him, “Go wash in the Pool of Siloam” (which means Sent). So he went and washed, and came back able to see” (John 9:6-7). The clay represents the anointing we receive at baptism, making us “Anointed Ones,” (Christs, or Christians) and the washing represents the washing in the water of baptism. The blind man can then see, he is “enlightened,” the name the Church gives to baptism. Two observations: to be truly enlightened, we need humility. We need to know that only God can give us the vision we need. To do that, we cannot rely on our own “opinions,” we must hear his Word in the gospel, we must worship him with his people, we must be attentive to the voice of his shepherds in the teaching of the Church. If we believe only in ourselves, we risk condemnation, as Jesus told the Pharisees, “If you were blind, you would have no sin; but now you are saying, ‘We see,’ so your sin remains” (John 9:41). True knowledge comes only from the Holy Spirit, “But you have an anointing from the Holy One, and you know all things” (1 John 2:20). The second observation is that in these three weeks, our Lord calls to baptism the most unlikely people: a friendless man lying lame by a pool, a shameless woman with serial husbands, and a blind man about whom the disciples ask, “Rabbi, who sinned, this man or his parents, that he was born blind?” (John 9:2).